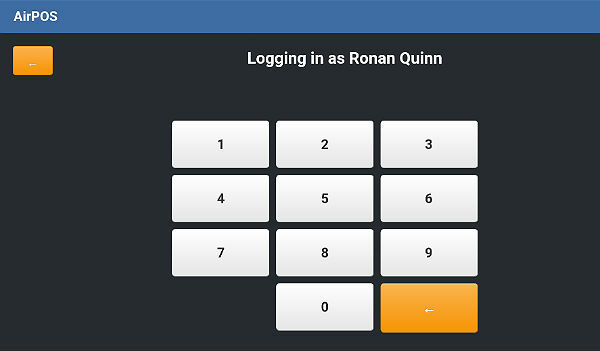 How to change the employee logged onto your till device. How to Switch User in the AirPOS POS Application. 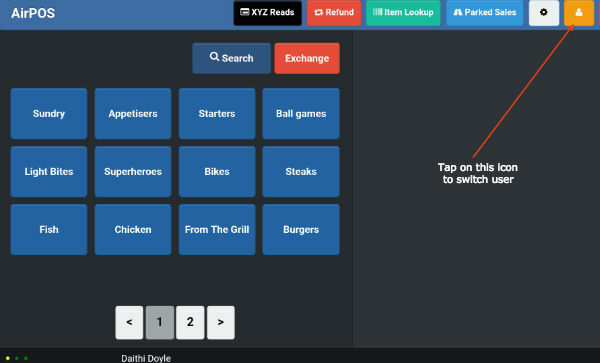 At the top right of the POS screen are a number of icons. The orange icon that looks like a head and shoulders silhouette is used to change the operator on the POS. Tap on that icon as shown here. If you have an open transaction on the POS you'll see a warning telling you to either void or park the sale. If you press the void button the transaction will be lost. If you press 'Park' a popup will appear in which you name the transaction. Once you've parked any open sales the screen will revert to the login screen. Tap on the name of the user you want to login as. And finally enter your user PIN on the keypad.